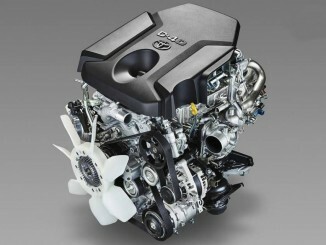 Toyota’s newly developed direct-injection turbo diesel engines raise the bar for fuel efficiency, power and quietness. The world’s first use of Thermo Swing Wall Insulation Technology (TSWIN) makes the 2.8-liter 1GD-FTV engine one of the most thermally efficient in existence, with a maximum thermal efficiency of 44 percent. Despite smaller engine displacement in comparison to the current KD engine, maximum torque is improved by 25 percent and low speed torque improved by 11 percent, while fuel efficiency has received a 15 percent boost. The engines also have Toyota’s first-ever urea Selective Catalytic Reduction (SCR)6 system that can eliminate up to 99 percent of emissions of NOx (nitrogen oxide), one of the main causes of air pollution. Precise pilot injection matching the state of the ambient air occurs before the main injection to shorten ignition delay, achieving stable combustion even in the world’s harshest environments, while ensuring quiet operation and high thermal efficiency. Use of Toyota’s proprietary, compact, high-dispersion urea selective catalyst reduction system eliminates up to 99 percent of emissions of NOx (nitrogen oxide), one of the main causes of air pollution. This will help vehicles conform to Euro 6 and the 2010 emissions standards set by Japan’s Ministry of Land, Infrastructure and Transport. 3 Technology that reduces cooling loss during combustion. Japanese specifications only at present.